Werner's Cairns blog: My Green Ants, and Dragon Fruit - an interesting observation. 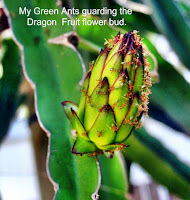 My Green Ants, and Dragon Fruit - an interesting observation. The top three buds were covered with Green Ants, but there was little movement - they are just sitting there, and you see their “antennas” moving and some make a brushing motion with their front legs. I’m wondering what they are actually there for, but I noticed that the buds are exuding some nectar or some other sweet stuff. So that would be a good reason why they are there. Maybe, they are also there to guard or protect them from insects dangerous to the bud - I will probably never know. Occasionally some run away and others come to replace them. They are there day and night; I often go out with the torch and watch them before going to bed. They are fascinating little creatures.The interesting thing is, the bud number 4 at the bottom was “Antless” – I just invented this word. So, I put my thinking cap on, wondering all day why there were no ants. Haven’t the scouts discovered this bud yet? Or, was it too far away from the other three perhaps? Well, I decided to help them to discover this “lonely’ bud at the bottom. This was the least I could do for my green little biting friends. After all, I thought, I published a story about them in a glossy German magazine for which I got $300.00, so I owed something to them. I took a little brush and held it on to one of the top buds and I immediately had three ants on it. I transferred them to the bottom bud. Two of them stayed there and one of them ran off to the top. I assumed that it was going to tell the others that there is a bud at the bottom with the population of two ants. I think what I did could be called “Anting around”. (Another word invention, I’m contributing to the English language.) After I came back after one hour, the bottom bud had now a large ant population. I felt like a proud Scout, having done a good deed, but I bet they won’t recognise this and will bite me if get to close too them. To enlarge picture, click on them. Fascinating little creatures, and an interesting posting. Thank you. I really love your ant- research! I am always in between regarding ants! I once got bitten from a huntsman in Tassie! That was very painful! But I also know they are doing a good job! Now I realised that I have something in Common with them: We both love Dragon Fruit! Werner I enjoyed reading your story, very interesting. And, good on you for contributing new words to the English language. Thank you, Werner, for another fascinating story. Your postings always arouse great interest with my family. Keep it up please, and all the best in the New Year. 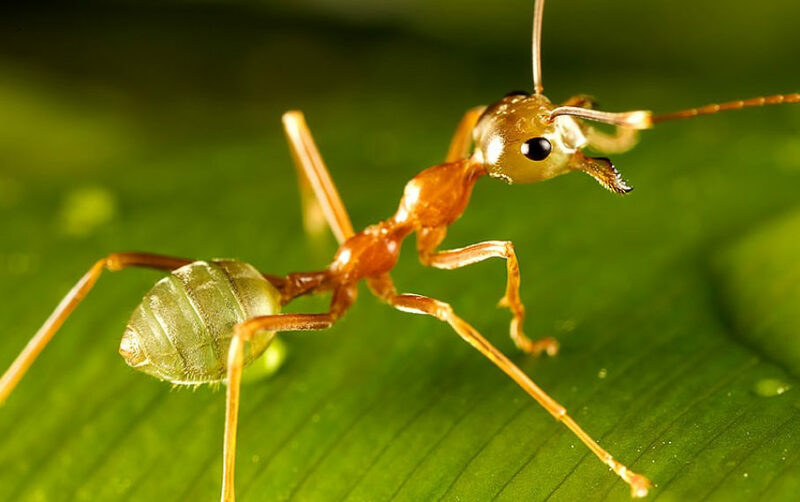 You have a nice way of observing and describing - and helping the ants (and the bud). I´m also an animal lover and like to observe them. Werner, I had an interesting discussion with the Mareeba farmer with the roadside fruit and veggie stall at Caravonica on the weekends. He grows pitaya which I love (yellow dragon fruit). He brushes them with a hearth brush to get rid of the prickles before he sells them – nice trick. He said they fruit several times a year and all he has to do to bring them on again is turn the sprinklers on them (like rain). He grows his dragon fruit on other fruit trees so he has a ready supply of green ants since they fertilize the flowers – as you know, only one chance at night or early morning. Only thing I haven’t figured out is how to get more fruit. I have 6 red plants on poles with a lattice at the top of each. I have green ants too and usually get about 3 out of 4 setting. I have seen pictures of them growing in pots in the Philippines absolutely swamped with fruit, but I only get 3 or 4 at a time – this is my second season. Is there a trick with fertiliser or something you would be willing to share to get them to fruit prolifically?